DUG Insight User ManualFrequently Asked QuestionsFrequently Asked Questions HorizonsHow do I perform an amplitude extraction between two horizons? An amplitude extraction between two horizons can be done from the Map View (see Horizon Operations in Map View - Amplitude Extraction). 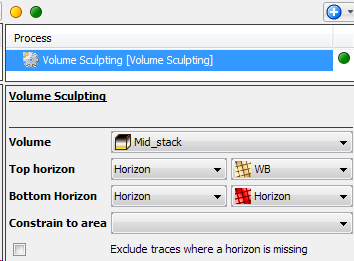 Alternatively, you can also perform an amplitude extraction between two horizons by using a sculpted volume. Follow the steps below for a different approach to amplitude extraction between two horizons. Note: You should first familiarise yourself with how to perform an extraction along a single horizon (see the "Mapping and Attributes" tutorial video, or the Single Horizon Amplitude Extraction section in the User Manual). From the Control Panel, open the Process tab. In the Process tab, click on the Add icon (+). Scroll down and double click on Volume Sculpting. In the Details Panel, select the input volume to sculpt at Volume. 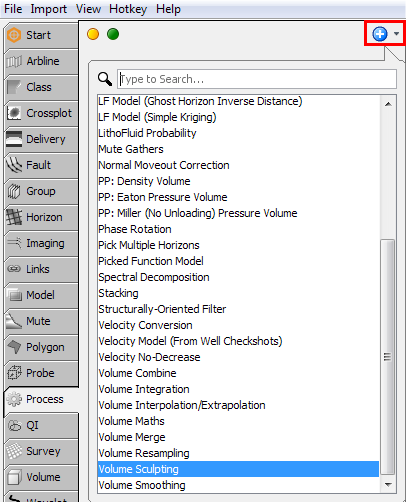 At Top and Bottom Horizon, choose the top and bottom horizons that you want to extract between (and your data volume). At Constrain to area, select a polygon/probe to constrain the sculpting to the area covered by the polygon/probe (see Creating a Polygon in Map View, Creating a Probe). Select the Exclude traces where a horizon is missing check box to remove traces where one or both horizons are not present. By default, areas of the volume not covered by the horizon(s) are unmodified. From the Control Panel, open the Map View. At Horizon, select either the top or bottom horizon. Click on the spanner icon beside the horizon property. Choose the sculpted volume from the previous step as the Volume to use. 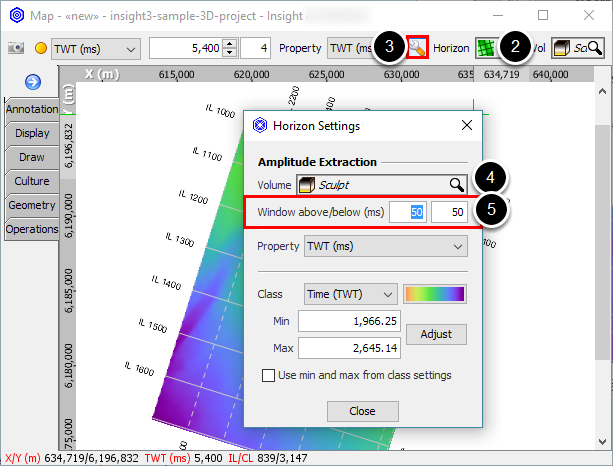 If you chose the top horizon, set your Below amplitude extraction window large enough to cover the entire sculpted volume (or the Above window if you chose the Below horizon). Prev: How do I extract the number of events between 2 time horizons? Next: How do I dynamically update an Isochron Map?